So you’ve grown up your entire life thinking you’re a Sagittarius. You’re an Archer, you’re invincible. All of a sudden a new study comes out and boom! You’re stuck there holding a snake, you’re an Ophiuchus! This is exactly how student Jenny Weaver feels. “I was Leo. Now I’m Cancer. Great,” Weaver complained. And she’s not the only one with a few gripes about this ‘new’ science of which people are starting to take notice. The truth is it really isn’t all that new. We’re taking all of this old news, Astrology that dates back to the times of the ancient Babylonians, and putting it back into place. This is because of the moon’s gravitational pull on earth, which has pushed the alignment of the stars back by about a month, affecting the way astrology works. 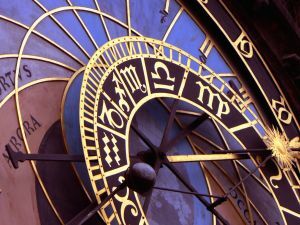 Astrology is based around the position of the stars, not the dates of the calendar, and that’s why it’s become tricky. Ancient Babylonians had 13 signs originally, and now that the stars have been pushed back, astrologists have chosen to reincorporate the sign that had been axed out years ago, Ophiuchus. Now it has pushed all of the other signs around, according to one source. However, other sources claim that this isn’t going to affect anyone who follows the western zodiac. Still other sources are telling the world that because it’s based on star positions, this only affects those born after 2009. The knowledge of students is ever varying. Many reacted with shocked ‘What’s?’ and many questions, such as asking if they can choose to stay with the sign they were. One of the few students who knew something about the subject, Cheyenne Brubaker, didn’t know much. “I heard it was in some different country or something,” was all Brubaker knew about the issue. Until astrologists come to a collective decision, or publicly announce their collective decision, the public may have to remain in the dark and adjust to their new signs. While this frustrates many people, it could be the best option for the time being. That’s not to say people can’t be frustrated about it. Student Suzanne Brown gave her two cents, voicing the same opinion many others have.